The Liberal Bee Jay fans can ? ?t get enough of that NBC World Series championship last month. So much so that they are now gobbling up NBC World Series championship t-shirts. The shirts are available at KSCB, [email protected] Sand, and the Hi Plains Daily Leader. The shirts are 15 dollars and exact change is required. 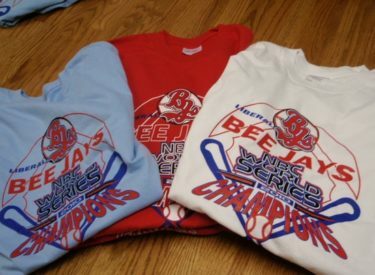 You can also purchase the shirts here on beejays.com. The short sleeve shirts come in red, powder blue, and white. Liberal won their 5th NBC World Series title August 13 with a 9-6 win over the Seattle Studs. Liberal finished 38-14 this summer.